By the end of this post, you will know what a derivative is. You won’t know how to find one yet, but you will know what you have if you are given one! Let’s say that we were given a function such as f(x) = x3 -4x. If you wanted to know the slope at a given point, you could estimate it by drawing the tangent line and then finding the slope of that tangent line (as we have seen in the last post). 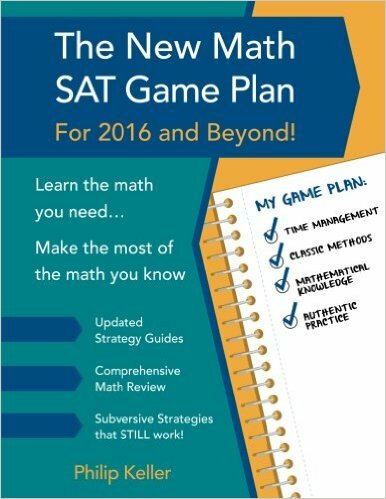 But there is an alternative to that method that is useful and quick. When you have the rule for a function, there is a way to derive a formula for a new function that will give you the slope of the original function’s tangent line at any x-value you choose. Since it is derived from the original function, this new function is called “the derivative” of the original function. The symbol f’(x) is pronounced “f-prime of x” and it is the most commonly used symbol to represent the derivative of the function f.
1. How did we get from the function f(x) = x3 – 4x to its derivative f’(x) = 3x2 – 4? I will show you how to “take a derivative” in the next post. Once you learn a handful of rules, the process is not difficult. It’s easier than factoring. It’s easier than long division. 2. Why would anyone want a slope-finding formula ? For now, my goal is simpler. I just want to be sure that we understand what it is that the derivative formula tells us. And once again…it’s better with diagrams. The blue line is the original function, f(x) = x3 – 4x. The purple line is the derivative, f’(x) = 3x2 – 4. The red line is the tangent line. You can calculate the slope of that tangent using rise over run if you want to, but you don’t have to. The applet does the calculation for you – look in the pink box. Now let’s pick a point on the graph and examine all of the lines on this diagram. At x = -2, f(-2) = (-2)3 – 4×(-2) = -8 + 8 = 0. This means that (-2,0) is a point on the graph of f.
At that same point, the tangent line has a slope of 8 (as you can see in the pink box). If we plug x = -2 into the derivative formula, we get f’(-2) = 3(-2)2 – 4 = 12 – 4 = 8. 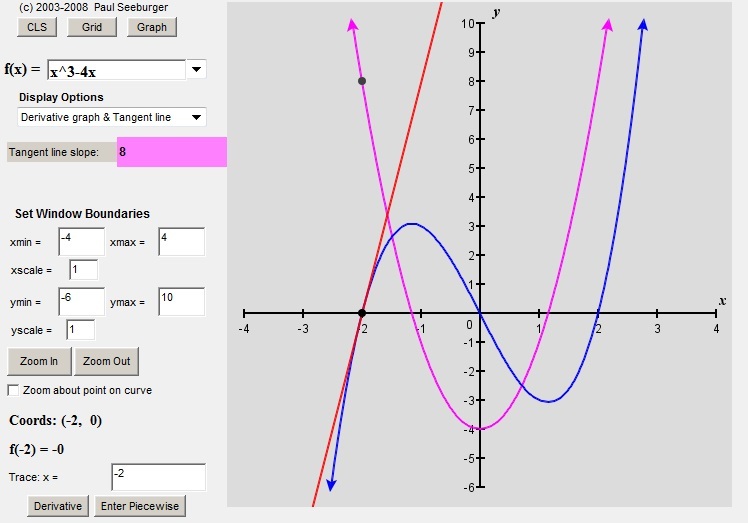 And then, when you look at the graph of the derivative (in purple), you see that (2,8) is a point on that graph. So the derivative formula tells us the slope – at least at that one point. But does it always work? Well, let’s look at another point: x = -1. At x = -1, f(x) = (-1)3 – 4(-1) = 3. So (-1, 3) is a point on the graph. Then, f’(x) = 3(-1)2 – 4 = -1. So we expect the slope of the tangent line to be -1, and it is. 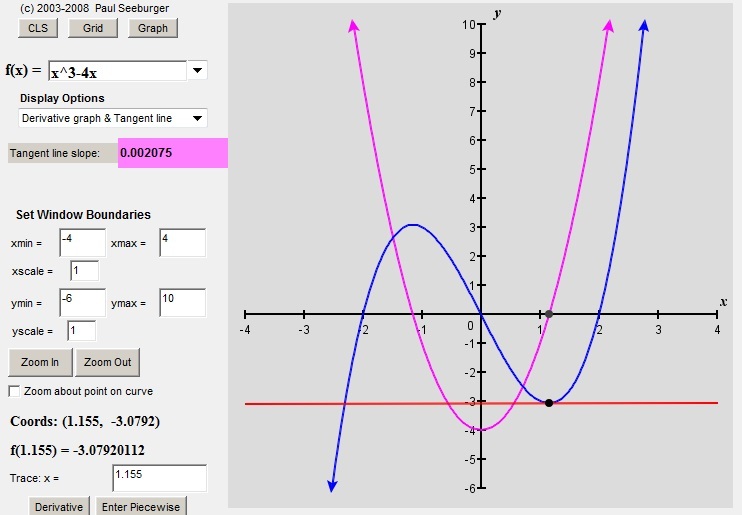 You can see that (-1,-1) is a point on the graph of the derivative (again, the purple one). So once again, the derivative formula has given the slope of the tangent line. Look at the value of the derivative. And then look at the shape of the graph. 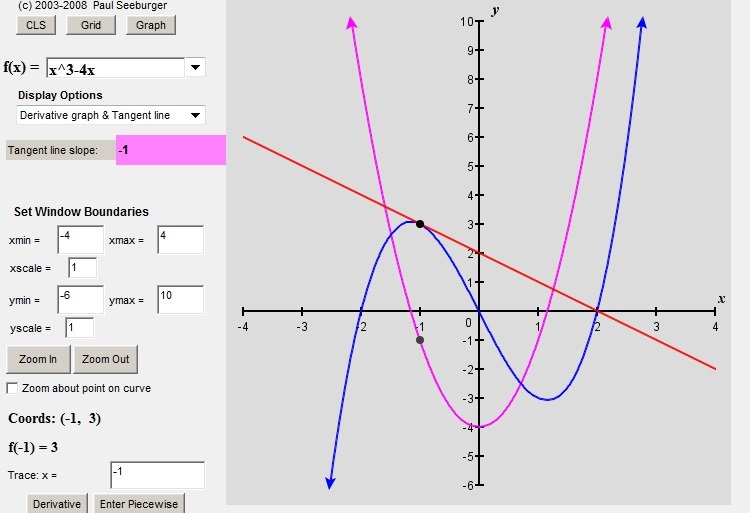 Where the derivative is zero, the graph has a horizontal tangent. That little fact turns out to be a big part of one of the reasons why we care about derivatives. They help us to find places where the graph has a maximum or (as in this case) a minimum. We’ll be hearing more about that later. So if you are skeptical, run the video and then pause it wherever you want. You’ll see that the slope of the tangent line always matches the value given by the derivative. Derivatives really are slope-finding formulas.